On this Airstream Life vLog, we take you along as we explore some of Olympia. First we stop at Tumwater Falls Park to see where Olympia Brewing Company used to be and check out some very pretty waterfalls. Next we head to the weekly Olympia Farmers Market where the produce looked amazing before stopping at a brewery for some beer, popcorn, and lunch. 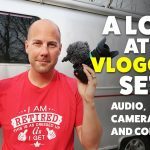 Once back at the Airstream Steve shows you how he tightened the bike rack on the front of our truck and some of his new favorite purchases from Amazon including a cell phone mount and silicone wedding rings.